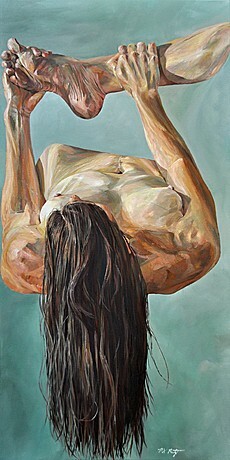 Recovery, Oil on canvas, 36" x 18"
As a former Naval Officer, ballet dancer and reporter, I've seen a variety of people in ways they refuse to see themselves. I've also learned to press against my assumptions about what seeing involves. This painting has no single point of view, little illusion of depth, and the figure's proportions probably seem off. I aim to paint with documentary accuracy while also doing my part to induce a state of unstable wonder about the unstable ways we see each other. Our hearts beat, lungs expand, and our eyes make continuous saccades, seeing not in single points of view, but in paths of attention that add memory and prediction to our sense of an unfolding now. How can painting reflect some of that? I employ a two-part rule in the studio lately: measure and move. With each spot of canvas I paint, I move my head to a new location. With a live model I measure every body part--every toe, collar bone, and eyeball--rendering them on canvas exactly the same size as in life. These body parts stack together in unfamiliar ways, and through the process of connecting them I find myself newly aware of the artifice necessary to make these pictures look something like the breathing, moving people whose presence provokes them. This is one small way of seeing in life-size precision outside of Renaissance perspective. We're so used to photographs, and a photo's split-second sample of light through a single lens does a great job recording info about the sights we see as we chat, cry and sing with other people, but it is far from the whole picture. My work invites viewers to renegotiate the rules by which we make pictures of each other. No picture is an exact repetition of our encounters, but as we act on our compulsions to get close, we should also practice making pictures in ways that question the iPhone-camera-Facebook idea that photos can remember our memorable events for us.